Copyright Beyond Law - Regulating Creativity in the Graffiti Subculture is the title of a new IP book ready for your Christmas Stockings. The title should be interpreted as “it is what it says on the tin”. Copyright law and the subculture of graffiti are so well interwoven in the book that you forget you are reading a book about law. I noticed this because essentially I do not to take work home and suddenly the book was in my night table and I was engaging on it as it were a novel. I became more aware of this topic at the Society of Legal Scholars Conference (SLS) 2013 in Edinburgh where I was presenting a paper. Marta Iljadica was presenting also a paper, her topic was ‘Graffiti, copyright and culture: urban space/public domain.’ We then have the opportunity to chat and I found myself totally absorbed by the topic, or perhaps by Marta’s passion for her work. Either way, this is transferred into the book. Selfie :) my early Christmas present. 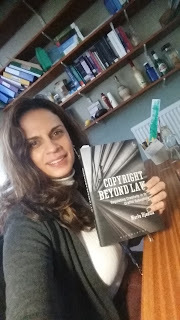 By reading the introduction you understand that the book is not just about copyright and the law – extending theories to graffiti. It starts by using a quote “Graffiti breaks every rule but within itself still has rules” (Anon 29). This clearly tells you that you are going for a ride! I felt myself into different worlds: graffiti the vandalism; graffiti the work capable of copyright protection and even trade mark (see chapter 4); and graffiti and the framework among the graffiti writers (I learnt from the book this word – I used to call them ‘graffiti artists’ –chapter 1 covers the fine line between graffiti writers and street art). Marta manages to emerge you in the graffiti world because her work was based on empirical research and thus, she in a way directs you on how to understand graffiti in its own right rather than fixing it into any other type of copyright work. The book not only see graffiti as a subject matter of protection under copyright but supervises the expectations that graffiti writers have in the society i.e. use of graffiti outside their cultural environment e.g. photographer, commercial exploitation (used as logo); and on the other hand, the subculture of sharing, creating, attributing, territory (claimed by a graffiti writer), to name a few. Chapters that I enjoyed the most were 7 and 8 ‘Graffiti rules – be original, don’t bite’ and ‘moral rights’. The latter I was not expecting since the book is based on UK – while common law recognises them, it does so up to a lesser extent than civil law jurisdictions. Anyone! colleagues and even friends who are not actually linked to law. Oops! 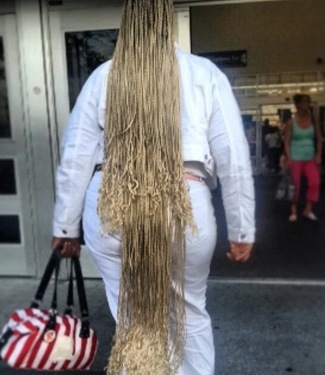 Where can you get it? Hard copies and e-books are available in this link. Blog readers can claim a 20% discount on the book - the discount code is CV7. Panama got some news for us: pushing to the top! This month I received some fresh news from Panama. This is quite unusual for this blog – just by doing a little search in our database this fact is revealed. Is something happening in Panama? YES! Mr Álvaro Atilano, CAF Ejecutivo Principal/Coordinador put me in the right direction. He noted the Patent Regional Initiative that is taking place in Latin America which is part of CAF (Development Bank of Latin America). 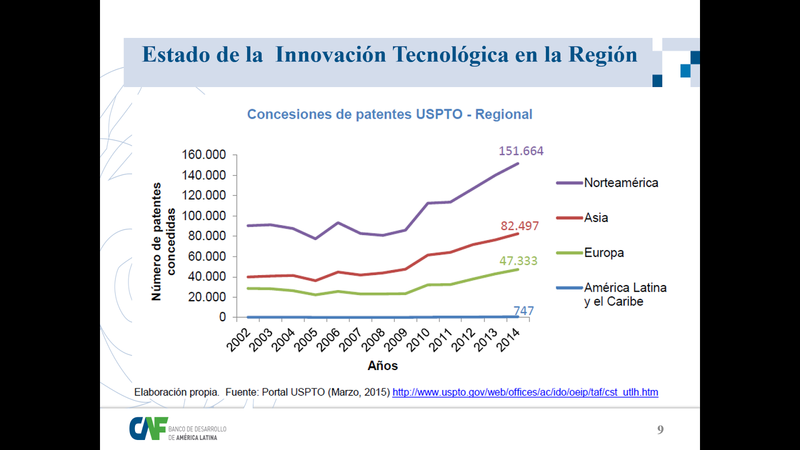 The initiative appears to start having an impact on the patent industry in the region. It is believed that in a couple of years’ time, the project and the region will be much discussed in IP circles worldwide, and surely will be an example to follow in non-industrialized countries. CAF provides with services in the form of loans, co-financing, credit lines, financial assistance services, and technical assistance to name a few. Due to the low performance of the region in the development of own innovative technologies, CAF decided (back in 2011) to establish a regional program– the aim? to reverse this trend. In order to proceed, CAF identified and prioritized certain factors/indicators which would be suitable for establishing and measuring the impact of this program. The factors identified were: International patent applications (PCT); Patents granted in important markets; Royalties arising from the licensing of IP; and High technology exports. A comparative analysis was done with other regions such as Asia, North America and Europe. CAF looks at key issues such as: “Developing patentable technology solutions to global problems and challenges identified from now on; Patents granted to have a minimum coverage of 1 billion people; Drafts of patent applications should be written by the inventor/researcher which will low costs; Prior to initiating any patenting process, market studies and technological prospecting should be carried out”. One of the countries selected for this initiative has been Panama and Mr Atilano has sent to the iptango blog a presentation on the impact that it is having in the country. CAF selected the Technological University of Panama (UTP) as a pilot. The plan is to make the UTP “the first Ibero-American University to be among the top 50 universities in the world in applications via PCT”. In fact according to the data UTP had introduced between September and October 2016 fifty-two applications via the PCT. Because of this result, CAF is considering to extent same strategy to several Panamanian universities and companies. It is going to do so during a period of 12 months. Thanks Albaro for making us aware of this project that looks promising not only for Panama but hopefully for more Latin American and Caribbean countries. The Asociación Interamericana de Propiedad Intelectual ((Inter-American Association of Intellectual Property) (ASIPI) has partnered with oriGIn (Organisation for an International Geographical Indications Network) to increase cooperation on Geographical Indications (GIs). And while this news may be a bit old by 3 months we are starting to see how the project is building up. In principle the plan is to “exchange information on GIs and related issues”. But going further as to promote, through networks, initiatives that support GIs. While for oriGIn the partnership is considered to “further promote the GI concept in the Americas”, on the other side of the pond it is seen as a great opportunity to acquire the knowledge and experience that Europa has – it is not only a matter of legislation but also practice. For example, in a recent fair (October 2016) called SAIL (International Food Exhibition) in Paris, the French Authorities seized a series of products that were either bearing or evocative of Protected Designation of Origins (PDOs). This ex-officio action is a European obligation for the protection of GIs which allows prompt action and withdraw of infringing products. Going back to the start of this project, the signatures in the partnership did not even dried when the ASIPI’s Sub-Committee for GIs was already organising a special publication which aims to compile administrative and judicial resolutions on GIs. The idea behind this is to make judicial decisions and administrative resolutions more accessible to any party interested. I am fortunate enough to be collaborating in the special publication and I welcome any input or suggestion of cases/decisions you would like to have at hand. For more information please contact Ninoshka Urrutia, Abogado y Notario / Attorney at Law, Socia / Partner, Consortium Legal – Guatemala. Our colleagues from the Journal of Intellectual Property Law and Practice (JIPLP) announced on its blog 'the' IP Publishers and Editors Lunch 2016. The invitation is open to everyone who is involved in writing, editing or publishing in the topic of IP. It includes bloggers, authors, reviewers, editors, and publishers. The lunch will take place on Friday 25 November, from 12.30 pm to 2.30 pm at Veale Wasbrough Vizards, London. It is free of charge but you would need to register for the event (please go to the original source here). Moreover, Stefanno Barazza is happy to speak to you via e-mail if you are not sure if you are eligible to attend. At the meeting Mr Jaani Riordan (8 New Square) will be discussing hyperlinking and the implications for publishers. The meeting is bound to have an excellent time and atmosphere for networking. I will be attending and hopefully will see some familiar faces that I know of just virtually. Thanks for the event guys. This month we hear some news from the Brazilian Minister of Science, Technology, Innovation and Communications, Gilberto Kassab, and the Minister of Science, Technology and Higher Education of Portugal, Manuel Heitor, who are negotiating a partnership to promote scientific and technological research. The bilateral meeting is a step to both countries to “develop a new scientific, technological and business agenda” and looking also in how they could attract other states in the Atlantic. The idea is to “develop the Centro de Pesquisa Internacional dos Açores (AIR Center)”. By this new partnership they plan to invite the rest of the Atlantic to develop a platform of cooperation. In the last couple of weeks we have covered in one way or another Research and Development (R&D) and the importance of it. Added to this we continue to encourage and explain the role of intellectual property -- especially in cases of transfer of knowledge. Indeed we are seen a trend in Latin America (and it is a good trend) --starting from the incentives and propaganda that Governments and other NGO are imparting i.e. to share knowledge, and finally seen different campaigns run by national intellectual property offices educating natural and legal process to protect their knowledge. Source Brazilian Minister of Science, Technology, Innovation and Communications. Ecuador's Intellectual Property Institute has reduced the fees for some of its services. According to Resolution 001-2016-CD-IEPI fees to file and maintain a patent have decreased by approx. 90%. The said resolution reforms the previous ones i.e. No. 003- 2010 CDIEPI (06/05/2010) and No. 006-2012 CDIEPI (23/05/2012). There was no doubt that the Ecuadorian Institute of intellectual Property (IEPI) fees were costly. Some saw this “as a tax on foreign IP owners rather than as a means of stimulating and encouraging the use of IP registration by local applicants.” Therefore one can question if this is a step forward in the building of the proposed ‘Código Orgánico de Economía Social del Conocimiento, la Creatividad y la Innovación (Organic Code of Social Economy of Knowledge, Creativity and Innovation) -- known as ‘Codigo Ingenios’ (Intellects Code). This bill went to the Ecuadorian Assembly back in June 2015 as an initiative of the Ministry of Higher Education, Science and Technology (Senescyt). 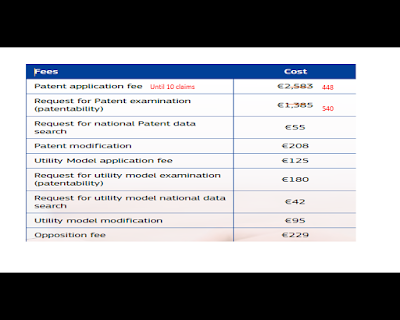 The reduction is seen on: patent application fee (until 10 claims); additional claim after the 10th; the renewal fees per year; and the examination fee up to 20 pages (and then, a 10% additional fee per sheet). 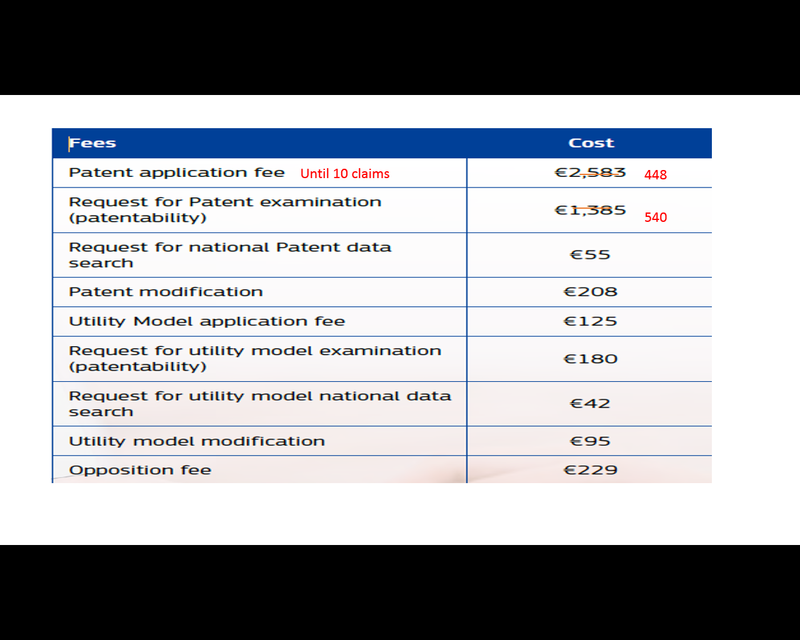 The graphic that you see, the original is available at the Latin America IPR SME Helpdesk, an IP fact-sheet of the country – next to the graphic (in red) the new fee is reflected. Resolution 001-2016-CD-IEPI entered into force following its publication in the official registry(which was Friday 19 August, 2016 - N° 822). Ann Chaitovitz, is the USPTO intellectual property (IP) attaché based in Lima. She kindly has published in linkedin an announcement that may be of interest to our readers in Peru. At the moment the US Mission Lima is looking for an “eligible and qualified intellectual property attorney” for the position of Commercial Specialist. The full job announcement can be found here. Thanks Ann for passing the info. The 04 of November is set to be the date where several people around Latin America are taken the streets. Organisations in Argentina, Colombia, Chile, Mexico and Peru are planning to take this day to mobilize for ‘democracy and rejection of trade agreements' specifically the Trans-Pacific Partnership (TPP) and the Trade in Services Agreement (TISA which is a trade agreement presently being negotiated by 23 members of the World Trade Organisation (WTO) including Latin America countries such as Chile, Colombia, Costa Rica, Mexico, Panama and Peru). A year ago 12 states ratified the TPP. From Latin America they were: Chile, Mexico and Peru (early post here). The call follows rejection of restrictive measures contained in these trade agreements. Accordingly the measures threaten the access to generic drugs and biosimilars, impose new trade conditions in the seed market, and restrict freedom of expression, among others. But this appears to be one side of the story -- the reason: the Office of the US Trade Representative asserts that the TPP will allow its members to “draw on the full benefits of scientific, technological, and medical innovation, and take part in development and enjoyment of new media and the arts.” However, one cannot forget the headline of this sentence “Supporting American jobs by promoting America’s innovation advantage.” This is followed by assertions such as “strong and effective protection and enforcement of IP rights is critical to U.S. economic”. These types of expressions seem to be one-sided i.e. the benefit is first for the US. However, in the US Trade Representative report we notice declarations such as that the TPP “Promote innovation and the development of new, lifesaving medicines”; “Promote affordable access to medicines, taking into account levels of development among the TPP countries and their existing laws and international commitments.”; and concluding that all IP “commitments are aligned with the Doha Declaration on TRIPS and Public Health, affirming the rights of countries to take measures to promote public health.” But we all know too well that such commitments when transposed to bilateral agreements are more than what they say…one is familiar with the term TRIP-Plus. There are indeed two sides of the story and this is tracked by the fact of the claimed ‘secret negotiation’ that went on which was for many years a source of controversy (see news here and here). Known product: TPP requires members to confirm that patents are available for either ‘new uses of a known product, new methods of using a known product, or new processes of using a known product’. Chile IP Law N° 19.039: Art 33 (e) notices that new uses of articles, objects or known elements may constitute a subject matter of invention provided that the said new use solves a problem without prior equivalent technical solution. Mexico IP Law (last reformed published on DOF 01-06-2016): not stipulated by lawm thus do not recognise second use as a new invention. Peru: Art 21 Decision 486 CAN notices that already patented products or processes, including the state of the technique, are not subject matter of new patents, for the simple fact that there is a new use which is different from that originally contemplated by the initial patent. 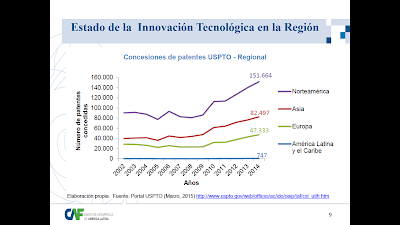 Bear in mind that second use patents are not allowed in any of the Andean Community States (Colombia, Ecuador, Peru and Bolivia). CAN legislation is supranational. Grace period for disclosure: TPP grants 12 months prior the Patent Application. This is in cases where the ‘disclosure’ is done by the applicant or a third party that obtained the information from the applicant which will not be taken into account when evaluating the novelty of the patent. Chile: Art 42(a) IP law notes that disclosures made within 12 months prior to the submission of the application will not be considered for purposes of determining the novelty criteria if the public disclosure was made by the applicant of the patent, or if the disclosure was derived from abuse and unfair practices. 'Patent Term Adjustment' (PTA) – some literature called this a patent ‘extension’, I do prefer to call it as it is: an adjustment given due to unreasonable administrative delays during the issuance of the Patent. TPP provides for the possibility of requesting a PTA. Chile: Article 53bis1 IP Law already grants a PTA. A right holder may request within 6 months of the patent granted, a Supplementary Protection due to unjustified administrative delays. Mexico: silent. The law does not cover this issue. Peru: Decision 486 CAN does not cover this issue. Many debates are seeing on regards to public health and we have covered this several times in this blog. This time it was time for a change - to cover a little bit of the procedural issues and some tips for enterprises when registering their patents abroad.